Freelance Drummer, Percussionist, Composer, located in Frankfurt a.M./Germany and New York, playing gigs, recording, teaching and working in different projects. Thea plays a wide array of genres, from classical music to jazz, blues, rock, pop, latin, brazil. 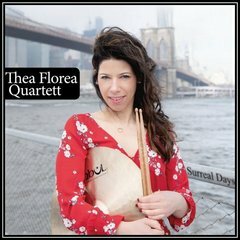 Thea Florea studied Jazz-Drums and Orchestra Percussion at Berklee College of Music, Boston, FMW Frankfurter Berufsfachschule für Jazz- und Popularmusik and at Musikhochschule Mainz. Thea is involved in numerous musical projects, currently playing with her own group, The Thea Florea Quartett, for which she also composes, Jazz Groups Duo Here- Trio Now! and Open Space Project, All Female Jazz Group The Floreas, Singer/Saxophonist Kathi Monta, Singer Helen Pfaff, Latin Rock-Pop Group Pillo Verde and Drum Events with Escola-de-Samba. Thea teaches private drum lessons in her studio in Frankfurt/Main. Some of her favorite drummers include: David Garibaldi, Vinnie Colaiuta, Tony Williams, Steve Gadd, Elvin, Jones, Dave Weckl, Stewart Copeland, Terri Lyne Carrington.